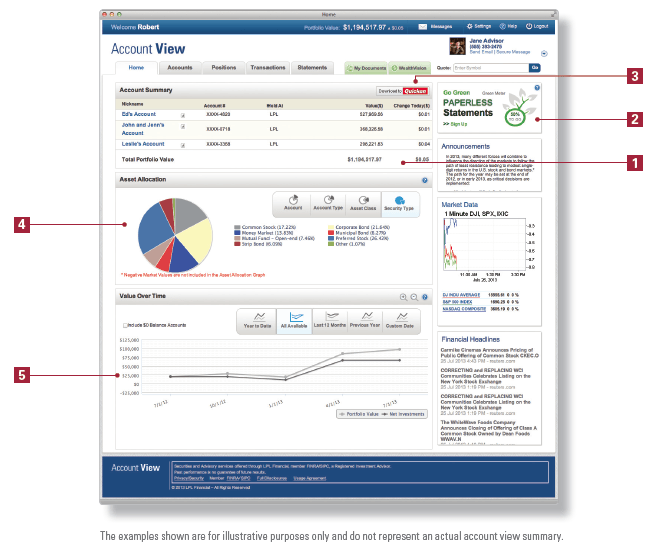 Account View offers simple navigation through accounts, positions, transactions and statements for an intuitive, clear experience. Accounts For one or all of your accounts, you can view the asset allocation, value over a set period of time, balances and margin details. Transactions The last two years of transactions are viewable and can be downloaded. Use the filter options to select specific time frames and transaction types to limit your search results. Statements View your statements, tax documents and trade confirmations. You can easily go paperless on your statements and trade confirmations. Do you want to reduce the amount of mail you receive? Account View offers you a simple way with the option to participate in the eco-conscious effort of turning off your paper statements and trade confirmations. In addition to the environmental benefits of going paperless, you can organize and simplify your life by eliminating clutter and unnecessary mail. Rest easy knowing that your information can be found securely in Account View. Convenient. Easy and fast access to your statements with the ability to save and print. Green. Play your part in the effort to protect the environment. Simple. All it takes is one click. Organized. No longer a need to store and file your paper statements. Safe. Advanced security protects you from the possibility of mail fraud and identity theft. To sign up, click on the Go Green Meter on the homepage or go to the Statements tab and click on Go Paperless. 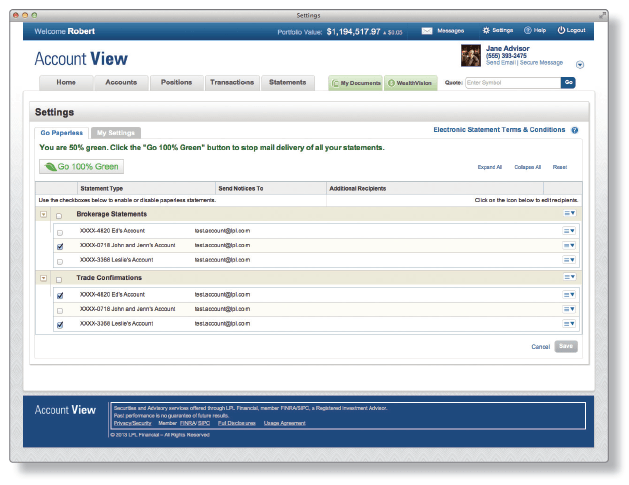 Account View allows you to quickly access your contact information, manage accounts and update your settings. Please note: If you would like to add an account that does not have your social security number listed, such as a 401(k) with Tax ID or your spouse's individual account, please contact our office. From the Account View login screen select Forgot Password? Enter your username and select Continue. 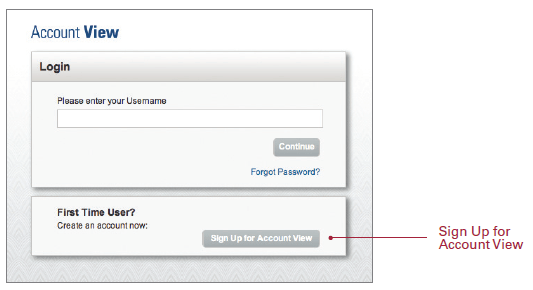 An email will be sent to your email address on file, from noreply.myaccountviewonline@lpl.com, with instructions on how to complete the password reset process. I've locked myself out of Account View. What should I do? To unlock your account without changing your password, contact our office. Otherwise, follow the password reset instructions above. How do I add another email address to receive notifications pertaining to my statements? From the Go Paperless screen, select the dropdown arrow located to the right of the statement you would like to edit the recipients on. Select Add Recipient, enter the email address you would like to add and select OK. Please note: recipients will receive notifications informing them that a new statement is ready to be viewed, but you must access Account View to view the actual statement. The system says an email was sent to me, but I haven't received the email. What should I do? Check your spam and junk folders to ensure the emails are not there. Add noreply.myaccountviewonline@lpl.com to your contact list or address book to ensure receipt of all emails going forward. What versions of Quicken does the system support? Compatible with all versions of Quicken since 2011. How much information will Quicken download? Your first download will default to inception to date. Subsequent downloads will allow you to change the date range. For more information on our financial services visit out homepage.